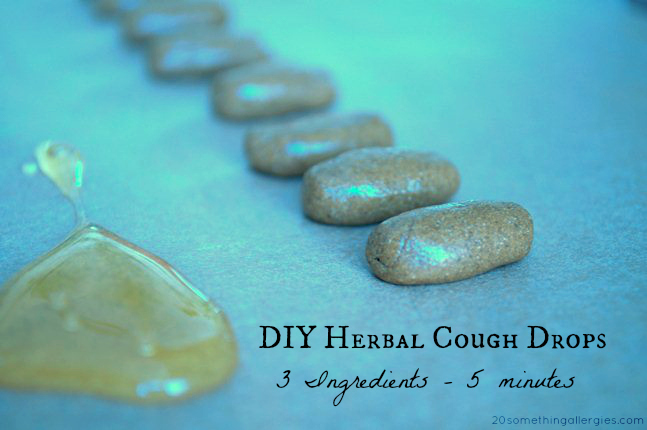 Did you know that commercial cough drops and sore throat lozenges make it harder to fight off an illness? The artificial colors and flavors in processed foods and medicines can cause symptoms such as hyperactivity, headaches, neurological problems, and cancer. The sugar alone acts as an immune suppressant. All because you wanted to soothe a sore and scratchy throat. Thanks Big Pharma. Instead of adding to your body’s burden, take a couple of minutes and whip up your own homemade sore throat remedy. Kids love to make these, and it’s a great way to keep them quiet for a bit when they’re not feeling well. Slippery elm (inner bark only) and marshmallow root are both mucilaginous and emollient, meaning that they have soothing mucous-like properties that act as a balm to your poor beat-up throat. Buy slippery elm bark powder here*. Buy marshmallow root powder here*. * These are Amazon referral links for the brands I use. Honey provides the same soothing properties and is antimicrobial. The antimicrobial properties help to kill viruses and bacteria and speed up the healing process. Note: Raw, local honey is preferable here for its healing properties. Factory-processed honey is now often contaminated with various sugar syrups, including corn syrup, to increase its yield. If you can’t find the ingredients at a local health food store, you can always hit up the world wide web and have it shipped right to your door. Combine all ingredients and mix with a spoon until they form a paste. Scoop mixture with 1/8 teaspoon (or 1/4 teaspoon and cut in half) onto a plate and refrigerate 3-8 hours to firm up. Remove from fridge and quickly shape into balls or lozenge-shapes. 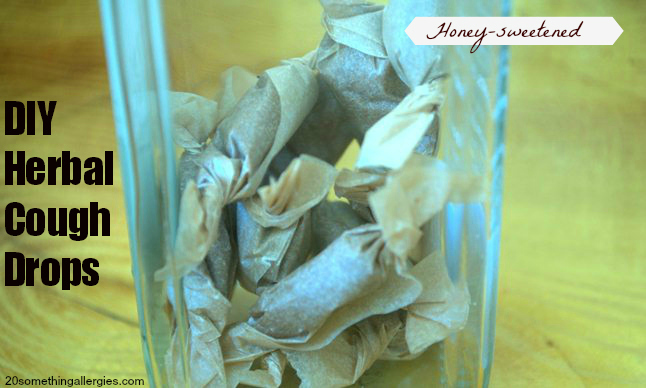 Store in covered container or twist up in pieces of parchment paper. Neat. How long will these last for? Though they are likely good for much longer, I would suggest using them within a month to be safe. Some people are ultra-sensitive to mold and bacterial growth and battling an illness is the wrong time to test it out. This is the coolest idea! I didn’t even know it was possible. This may be the worst explanation ever, but the only one that comes to my head is mainly honey with a slightly chalky chocolate taste. Mmmmm. lol. They’re actually not bad at all. If it helps, my 4 year old loves them, and I haven’t ever had anyone complain about the taste. Can you use other herbs, like horehound and thyme? And lemon balm, it’s antiviral, thyme is antimicrobial, and horehound is cough suppressant. Thanks for letting us know! I have never tried horehound so I can’t personally attest to the flavor, but it’s a good caution for those experimenting with other barks and herbals. I’m fond honey and its benefits to humanity. It’s a natural sweetener that’s healthy to the body. I might have to check out those kinds of roots in our market and try your recipe for cough remedy. Hope that works totally fine on me, is it also okay for kids below 10? Thanks! Yes. For children under 16, adjust the dose for weight (ex. 1/3 of adult weight would get 1/3 of the dose). Children under 1 year of age should not have raw honey, and children who are too young to understand sucking on a cough drop should not be given these to avoid a choking hazard. A tea made of slippery elm and marshmallow would be better if needed. Homemade broth salted with unrefined salt is the best sore thraat remedy for young children. Another reader mentioned that horehound wasn’t popular with her family, but, if your family loves it, then I say go for it! Cheryl, you may want to double check the information you get from WebMD. It’s not a safe or reliable source for healing information. It is the outer bark that is toxic and not safe for consumption. The inner bark of slippery elm that is used for medicinal purposes is considered safe during pregnancy. It is a good idea to verify the source and never use sources of questionable quality to be sure that there is no outer bark if using a powdered form for anyone consuming it. So on that note – of questioning the source of information – I was hoping you could point me in the direction of where you got your info on sugar being an immune suppressant and commercial honey being “watered down”, so-to-speak. Also, while we’re on the subject of the effect of sugar on the body, honey isn’t actually better than sugar for any of us. Structurally, honey and cane sugar are very similar in terms of their both being made of glucose and fructose. It’s just the percentages of these two monosaccharides that differ between the two sweeteners (and varying fractional amounts of other sugars). And while honey, especially raw honey, supposedly has amazing healing benefits, you’d have to eat a very unhealthy amount of honey to actually approaching anything near the health benefits it’s said to have. Sure, there might be trace amounts of minerals in honey, but trace amounts aren’t really going to benefit most folks due to the small amounts of honey most people actually consume. Honey does get a leg up on sugar, though, in that it’s not nearly as processed as sugar (though there are some unrefined sugars that also contain trace minerals). Frankly, if anyone is going to argue for honey being a healthy alternative to sugar, then it definitely is if you’re looking to follow a diet that includes minimally processed foods. And if you’re buying locally-produced honey from a local apiary. I agree that WebMD may not be the best source of information for some people – it focuses too much on pathology instead of holistic health. But I think in regard to your response to Cheryl, WebMD may be a better source of information than you are. While there is no evidence of side-effects reported with the use of slippery elm, that doesn’t mean it doesn’t have any contraindications with prescribed medications or other herbs. Any woman interested in using slippery elm during pregnancy would be well-advised to question her midwife, a master herbalist, or her doctor. I appreciate you questioning what you read to make sound decisions for your health, but your comments come off as accusing and as challenging me to do further research for you. I am a certified holistic practitioner and am well-trained in nutrition. If you had done your research (or even looked at my website’s sidebar), you would know that I was not an untrained blogger who was trying to act as an authority using ‘Dr. Google’ as my authoritative research. If you believe that WebMD is more qualified source of valid health information than my site, please feel free to visit there and elsewhere rather than spending your time disparaging my clinical knowledge and training. If you have questions on the information that I provide and are actually seeking to expand your knowledge, you would do much better to ask those questions directly and politely. “The decrease in phagocytic index was rapid following the ingestion of simple carbohydrates.” This applies to all sugars, refined cane sugar being the least beneficial due to it’s complete lack of micronutrients. You can also look up the work of Dr. Linus Pauling and Kenneth Bock, M.D. From a reductionist point of view – shown by your breakdown of sugar and honey into it’s basic sugar components to show their value – , yes honey does look similar to cane sugar when analyzed for certain properties. I have not stated to use it freely, and this is not a dessert recipe that contains copious amounts. Honey’s value is in the antimicrobial effects, and you will find it used in small quantities in this recipe to avoid ingesting large amounts of sugars. Here is a study abstract on the microbial benefits of honey for anyone who is now unsure if honey is a good natural remedy: http://www.ncbi.nlm.nih.gov/pmc/articles/PMC3609166/. I’ll let you find the sources that show processed honeys sold at standard grocery stores is pure. Please feel free to site your own clinical studies that show my information is incorrect. As to slippery elm root, I do not discourage anyone from speaking to their health professional. I reference my medical texts for herbal and pharmaceutical interactions and contraindications. I cannot say that it is 100% safe but only that there has been none reported. Slippery elm is also considered safe during pregnancy by the herbalist and midwifery communities. I have consulted colleagues in both spheres for this information. I love this! I cannot wait to try, I was just sucking on a cough drop and I knew there had to be a better way. I have some Marshmallow root leftover from some healing lotion I was making. It is not in powdered form….can I use a food processor to make it that way? Or would you suggest buying it. Thank you! Where can I find the roots for this? You can check out your local health food stores or pick it up online. Thanks for the recipe! Once these have firmed up in the fridge, will they stay solid if stored at room temperature? They will. I like to keep them refrigerated to extend their shelf-life and keep them from getting little fingers all sticky. I think I will tty these with cinnamon added. It would taste great and be even more antiinflammatory. That’s a great addition! Just be careful of using it with raw, scratchy throats because it can burn sensitive and inflamed tissues. These look really cool! Could I use mullein instead of the slippery elm? I just bought some along with marshmallow root. And, do you grind up the root/leaves in the blender to make a powder or is the powder something different? You can definitely try it! I’m sure there are a few variations that would work very well. I bought mine already powdered, but you can try grinding them up in a mortar and pestle or high-speed blender if you’re able to. I’m not sure how well it would work for those of us not used to working with the roots since they’re naturally a little gummy (mucilaginous). My husband is on an antifungal diet and is not supposed to have sugar or sweetner of ANY kind, except Stevia. If not using honey, any suggestions on how to hold the herbs together? You could use water, but I would suggest only making enough for 24-48 hours to avoid breeding bacteria and mold. I don’t find any contraindications for breastfeeding, so you should be safe. Just be sure to check the packaging and possibly your doctor is s/he is skilled in herbs. Can you make a large batch and freeze these? The honey may crystallize, but it should be fine. I would suggest wrapping them well and check them monthly.